Take the first step towards growing what you eat! is the simplest way to get your kitchen garden started. Let the fireworks this year be the flavors busting in your mouth. Simply Farm kits now come with edible fireworks - that everyone loves. 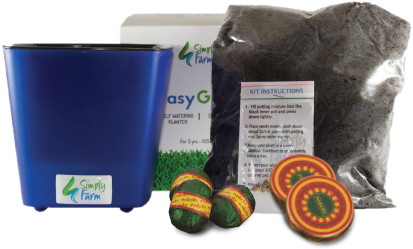 The DIY kit was designed to share the joy of growing your own food with kids & adults. We made a self-watering pot that can use soilless media and needs watering only once every 7-10 days. Watch your food grow in front of your eyes! And all it takes is 5 minutes of care per week. Optional Additions * Paper bag: Brown paper bag with 2 color logo print option. Jute bag: Ideal for a lunch bag or a quick run to the shop. 2 color logo print option.